This premium quality, 320gsm manilla Elba Strongline file contains 5 compartments for organising reports, projects, presentations, schoolwork and more. 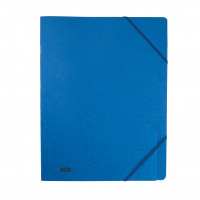 Suitable for A4 documents, the file also features elasticated straps to help keep contents secure on the move. This pack contains 5 blue files.